Join Billy Mitchell and Ray Laidlaw as they tell the story of Tyneside’s favourite band in a special two-man acoustic show combining their great songs with personal archive photographs and video that gives audiences an insider’s view of their 50 year friendship and career. It has been 10 years since they closed a remarkable 33 year music career, where their best-selling album, Fog on the Tyne took them to the top of the UK charts and songs like Run for Home and Meet Me on the Corner helped put them firmly in people’s hearts. 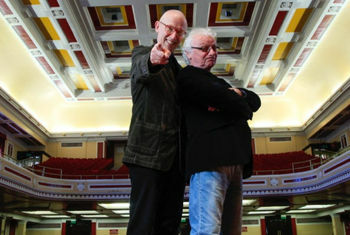 In 2012, Billy and Ray were invited by their local theatre to perform their songs and tell some tales of the 40 plus years in and around Lindisfarne. The result was so successful that they are embarking on a national tour on 2014 and 2015. Make sure you don’t miss them on their 6th date in the tour and the first in Yorkshire. Hear how the classic songs developed and how Bob Dylan’s producer helped them to focus their musical ideas and burst through the glam and manufactured sounds around them to become one of the major British groups of the seventies.